Apricots are in season. YIPPEE!! I have a couple sources for getting them, and whenever my stash gets low, one of the sources kicks in and replenishes it. Let's see, there's the local farmer's market, my coworker, and my mom. When the stars are aligned and I'm having a lucky day and I have so many apricots from combining my sources that I don't know what to do with them all, I turn to David Lebovitz for his fruity upside-down cake. 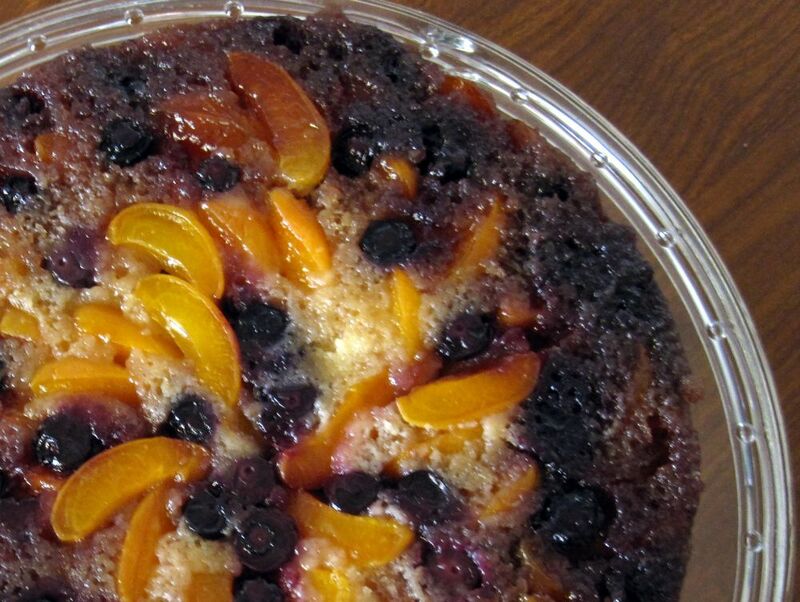 Ok, the original recipe, which I posted back in July of 2009, is a plum blueberry upside down cake. But Lebovitz notes that you can replace the plums with apricots. Voila. Today's post is really just a variation on the original. And I think I like it even more than the original. The skin of plums can be sour, but apricots don't seem to have that, at least not at the same high likelihood. So the resulting dessert is an almost guaranteed sweet treat, one that doesn't make you pucker, it just makes you swoon. Try to picture a brown sugar-buttery topping with cooked, sweetened apricots! I am swooning! I am in love! Since I already posted the original recipe a year ago, I'll direct you back there for the step-by-step photos. Just use your imagination to envision apricots in every photo that shows plums. 1. 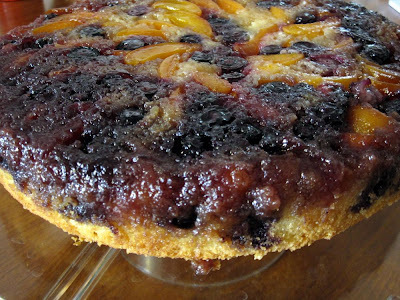 To make the plum apricot topping: Place a 9-inch round cake pan or a 10-inch square cake pan directly on the stove top. Yes, that's totally safe to do! Melt the butter in the pan over low heat (shouldn't take more than a minute or two). Turn off the heat. Add the brown sugar and stir until the sugar is thoroughly moistened. Spread the sugar across the bottom of the pan with the back of a spoon so it is evenly distributed and covers the entire bottom. Remove from the stove top and cool briefly. 2. 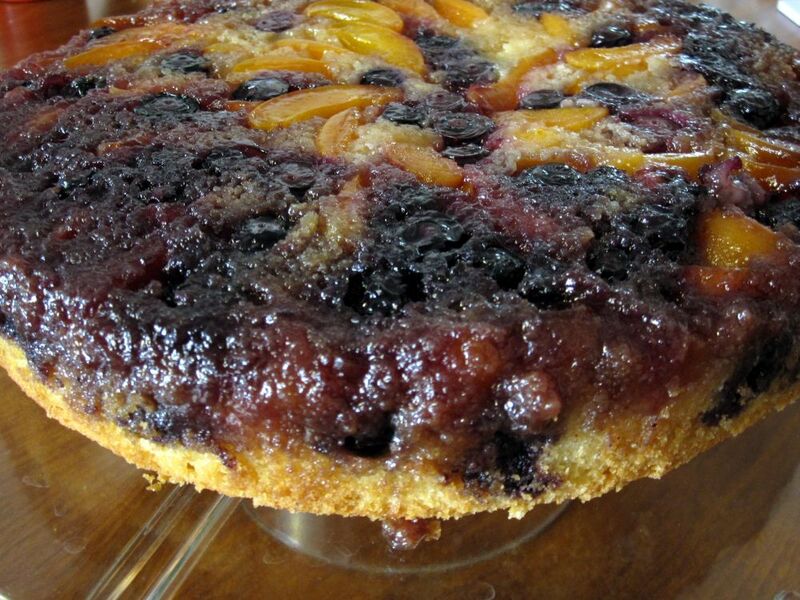 Sprinkle half of the blueberries evenly over the moistened brown sugar. Cut the apricots into half-inch slices. Arrange the apricot slices over the blueberries in concentric, overlapping circles, or you can be more abstract artsy and just scatter them. 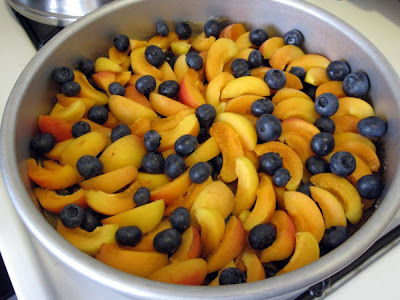 Try not to have any apricot-less areas of the bottom of the pan. Scatter the rest of the blueberries on top of the apricot slices. 3. To make the cake: Position the oven rack in the center of the oven and preheat the oven to 350 degrees F.
4. Beat together the butter and sugar until light and fluffy, 3 to 5 minutes in a standing electric mixer. Stop the mixer once and scrape down the sides of the bowl to make sure the butter is completely incorporated. Add the vanilla. 5. Beat in the eggs, one at a time, until well mixed. 6. In a separate bowl, sift together the dry ingredients: flour, baking powder, and salt. Then add the dry ingredients alternately with the milk into the batter, starting with half the flour mixture, then adding the milk, and then the other half of the flour mixture. Do not overmix; only stir until incorporated. The batter will be pretty thick, but shouldn't be lumpy. 7. Carefully drop giant spoonfuls of the batter over the fruit in the cake pan, and then use an offset spatula to smooth it out so it covers the entire surface. Bake the upside-down cake for about 1 hour (but I recommend checking at around 50 minutes, since my oven tends to be faster than Lebovitz's), until the top is golden brown and a toothpick inserted in the center comes out clean. 8. Let the cake stand at least 20 minutes before unmolding. Run a metal spatula around the edge of the cake to loosen it from the pan (I prefer a metal spatula over using a knife because it won't scratch the cake pan). Invert a serving plate over the cake, shake gently to loosen the cake, and carefully flip over both cake and plate at the same time. Lift off the cake pan and you will be mesmerized by the beauty to behold! If any fruit happened to stick to the bottom of the pan, don't fret! You can easily stick it back into the cake and no one will notice. Serve with whipped cream or vanilla ice cream.